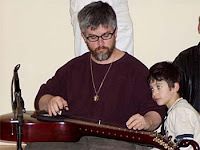 VH: In year 1998 you came back to Academy where you started to study ragas and interconnection between music and chakras. The product of your studying was album Sahaja Yoga Awakening (first version). It offers listening of short ragas on all chakras . Where is the origin of this idea to record this kind of album? And how long did you work on it? Could you give me advise how to listen it in the best way? DE: The origin of the idea to make this CD was somebody hearing me in America singing the mantras in this style and asking if I could record them to put on a website, initially. I was so happy to be able to give back something in this way, as the time I spent in India learning it was so beneficial to me and helped me so much during quite a tough period of my life. This first version was only available as mp3 and it didn’t take long to record. Then I just sent it to a yogi in the UK to convert to mp3 and it was ready. But then, a few years after that, I heard that the website had collapsed but people were still interested in hearing the mantras so I decided that I should record them properly and make a CD. I was in Canada by then ( lots of interesting stories of how I got there, but maybe another time!) and there was a very kind yogi who had some recording equipment and a very small closet/cupboard, where I shut myself in for a few hours! It was again very simple to record as by then, I had been singing the mantras nearly every day for 4 years, and the recording only needed my voice and my electronic tabla. Also, I had composed a few different ones which I wanted to include this time. Most of the ones I learnt in Nagpur were exactly as Arun Apte taught us but there were a few that he didn’t have time to show us, and so once I knew the Ragas, I was able to arrange new ones myself. At first, I only made a few copies of the CD as needed, as I couldn’t afford to produce them professionaly, but once I realised how many people were interested, I found a proper printing place and made 500 copies. The whole process seems to have taken at least 3 or 4 years till they were ready to sell worldwide. I don’t really know the best way to listen, as I don’t normally do that! But, you can either use the tracks individually to work on certain chakras, or listen to tracks 1-8 for clearing just the Left Channel or tracks 9-16 for working on the Right and Centre. Also, once you can see what Ragas are good for certain chakras, you can also find other music – maybe instrumental Classical Indian – that also use these Ragas. You can also experiment by just listening to Ragas and trying to feel which chakras are affected, as there are probably quite a few that can work on the same chakra. My CD only highlights one for each. VH: Your music is on CDs Millenium, Eternal Roots and Blossomtime too. Each song is different it shows your scale and possibillities.. Could you write me shortly about these compositions? 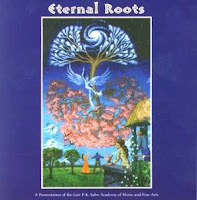 DE: Coming Closer – This is from Eternal Roots which was recorded at Nagpur. Most of us had songs that we had written before and wanted to include on the album. My other song on there was In the Beginning. My songs are composed in all sorts of ways and at all sorts of times. Sometimes I just hear a melody in my head, or lyrics just start coming. Other times I can be just playing on the guitar and some chords start coming together. Coming Closer, I seem to remember, was one of those songs that just popped into my head while I was out walking my dog!! When I got home, I immediately went to the piano and wrote down what I could hear in my head. But it was a couple of years before being at Nagpur and I hadn’t been able to record it properly. So, one day when we were discussing what songs to use, I started singing this to everyone, and it developed into what you hear on the CD. Guru Mantra – I don’t remember how this one came about, but I think the inspiration was partly from hearing another yogi singing a song called Guru Mother on an album, which I think used part of the mantra, although in a very different way to mine. She had been in a pop band and was the first person who practised Sahaja Yoga to have commerical success. Unfortunately, it was very hard for her in this business, and she became a bit shy after that and has not really been seen much since. But, hearing her song must have triggered something in me and my song manifested. 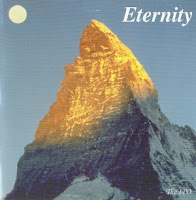 I also have two songs on the Eternity CD, which I think came after Blossomtime. These two are Now that I have Found You and Here for a Reason. VH: I know that you cooperate with TEV. How this job fill you up and how do you feel about it? DE: I joined TEV right from the beginning in May 1996, which was just after coming back from Nagpur for the 1st time. I was obviously in the creative mode and wanted to continue. I hadn’t done any acting for a long time but this felt so good to be involved in a Sahaj Theatre Company. It was very hard for us as we spent over two years together on and off, mostly just with one play that we worked on, The Imaginary Invalid, but we very rarely got any payment so we always had to go back to our normal lives in between and get jobs so that we could afford to tour again. Any money we did make usually went on costumes, travel, food etc as there were at least 16 people involved in the play. But it was an amazing experience and, although I wasn’t involved in the Magic Flute and other projects, as I was concentrating more on my music, I hope that we will be working on a new project together soon. VH: Did you ever play for Shri Mataji and where was it? DE: With Her Blessings, there have actually been quite a few times so I won’t mention them all, but performing with TEV twice – Ganapatipule Dec.1996 and Cabella for Guru Puja 1997, as well as being part of the UK puja plays a couple of times – Navaratri 1997 I think was one. With my singing, I have often been asked to sing harmonies on other peoples‘ songs but the first time I sang one of my songs for Her was also Navaratri 1997. While I was in the USA 2001-2002, I had the immense blessing to sing for Her during 2 birthday parties for Her great-grandson, Anand. This was at the ashram in LA and was truly an amazing experience as She and Sir CP were sitting so close to us. I have also danced for Shri Mataji at Navaratri Puja 2002 at Lake Piru, LA, where I performed a tap dance. I think it was the first time anyone has tap danced for Her. It was also the first time I had ever danced in public, as it was only something I did for my own enjoyment, so I was very nervous, as most people only know me as a singer or actress. I did nearly fall over during one part, but I hope She enjoyed it anyway! I hope I have answered your questions ok – they were good question! Here we will say good-bye to Debbie Eckman. Her last, the fifth songs CD ABOUT TIME introduces here in another level – she is rather a singer of her own songs in present modern pop/jazz style (although her two last songs are mixture of eastern music and various experiments). 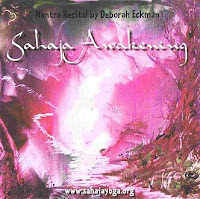 The CD Sahaja Awakening still remains her most important piece of work. What is this CD about? It brings 15 short pieces of music in which Debbie sings mantras for individual chakras, goes through individual channels and chakras. It is quite simple; just sit down before the picture, light your candle and lose yourself in meditation. 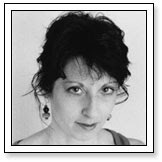 Compelling voice of Debbie Eckman is a reliable source which will get you easily to such meditation. 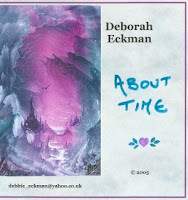 We should have met with Debbie Eckman at Adi Shakti Puja in England. We did not agree exactly the place and time, we simply knew that we will meet each other. After my arrival I tried to find her with my eyes in a thousand people crowd, but I did not find her. I had given everything to Shri Mataji and asked to arrange it. The Friday evening programme was about to begin and I sat not far away from the stage and scanned my surroundings. Suddenly in one of the entrances a tiny woman appeared with the guitar on her shoulder. Vibrations told me immediately that this must be Debbie. She sat near the entrance, took bandhan and started her meditation. She had meditated for a moment and then she looked around. I knew she was Debbie according to the photograph. I got up, went to her and said hello to her. We arranged our meeting later that evening, so that she could have prepared for her performance, when she played one of her new songs. Later we had met in the hall where we were selling the CDs of our Czech singer Lenka Adamova and we had a nice talk. The following lines give you the e-mail interview which Debbie gave to me in 2006 before my departure to England. VH: Your musical emanate from beginning of learning piano and drums. Later you found out the power of your voice. How was the beginning with a music and how an indic music affected bloom of your voice? I have heard your demo and I have to tell that your scale and style is really astonishing. You are able to sing almost everything. DE: Thank you! I don’t really remember when i first started to sing but there was always music in the house – my dad had a beautiful voice and loved to listen to Jazz in particular. He was the manager of a choir and all my family (2 sisters, 1 brother and my mum!) all joined at some point. This helped me to develop my ear for harmonies in particular as I started as an alto but then as my range grew, I became more of a soprano. Most of the music was of a Western classical nature, but with also some folk music and some popular. In the meantime, I continued to listen to all sorts of music at home and sang along with anything I could. I think this helped to develop my range. I had many singing lessons, both at college and privately until I finally started learning Indian music, which I think has given me the most depth to my voice and also the most naturalness, as you are not meant to use anything but your natural voice, whereas Western Classical singing is sometimes a little artificial in how the sound is produced within you. VH: In year 1994 you were in India for first time and you visited Nagpur. Could you be so kind and tell me about it. How it effected you and what musical beginnings were in Nagpur? VH: You met yourself a brother SM Babamamu. How was the meeting with him and how did you feel it? DE: I felt so much compassion from him and also that he had so much desire to help the Westerners to understand Indian music. I knew I had a desire to come and learn at the Academy but wasn’t quite sure how it would work out, as I didn’t have much money. VH: You returned back to London and worked in Wembley Arena. There I am sure you met many famous people especially in popular music. On your website you remember that you were addressed by the music of Robert Plant and Jimmy Page. And there connecting with eastern effects. How did you feel after comming back from India then? DE: Working there was not as glamorous as maybe it sounds, as I was just selling t-shirts and souvenirs, nor did I really meet anyone famous! But I did get inspired many times by the great artists I was able to see for free and that concert in particular made my desire to go and study in Nagpur a reality. So, back to the previous question of how the beginnings of Nagpur was – we all lived in different apartments across the town and I was blessed to live in the same block as Babamama so we saw him many times. The lessons were taught in the various apartments or in the homes of the teachers, depending on what you were studying and with whom. There were 15 students at that time (the start of 1996), mostly all from Europe. One day, Babamama took us all on a picnic to an orange grove some distance away from the town. We had to cross a small river to get to it and it immediately reminded us of the river in Cabella. He told us that he had bought the land and planned to build a proper Academy there, where we would be able to be in the nature all the time, away from the distractions of city life and able to concentrate just on our studies. The World Foundation has agreed to support a *Sahaja Music Festival*Cabella, to be held on Sunday August 3rd. This is an opportunity for any yogis who have ever wished to perform their material live before a Sahaja audience. P.S. Remember to pack your instruments! 2. How can I evolve as a person? - become a more spiritual and compassionate person - understand more about my place in this Universe - establish a relationship with God that is based on Truth not ritual and hypocrisy. If you recognise any combination of these needs in you, then you are part of a growing community of people who are becoming uneasy with the direction and quality of their life. 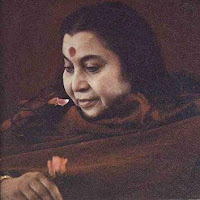 Sahaja Yoga can help to answer these needs through the ancient, gentle and yet powerful process of Self-Realisation and meditation…..
Down the ages, music has always been food for the soul. The Australian aborigines say that Music is your soul speaking .. it is the voice of our planet communicating to the universe. In India, it is valued above all things - a way of connecting the individual spirit with the Divine. Ancient sages discovered the 7 basic notes of the musical scale by listening to the sounds of nature or songs of individual animals. In meditation, we can feel that each of these 7 notes corresponds to the 7 chakras -or wheels of energy - within us. When the frequency of the note matches the frequency of the chakra, that chakra becomes activated and thereby strengthened. By singing or even just listening to the different notes, we can help to balance and ultimately heal our chakras. My musical awareness was very typical for a western family - jazz and musical theatre, with a smattering of classical, courtesy of my parents' taste, as well as a healthy dose of pop from my two older sisters. Apparently, I was dancing in my crib before I could walk, so it was obvious that music would play an important part in my life. I grew up taking an interest in ballet and tap dancing, as well as learning the basics of piano and drums, but the voice was my main instrument, graduating from choirs to solo performances. But it wasn't until I became aware of Indian music that I realized the full potential of the voice. I found my way to Sahaja Yoga nearly thirteen years ago, desperate to fill an emptiness that even music couldn't heal. At that time, Indian music was quite alien to me - a weird tinny sound that I heard from Bollywood films. But gradually, through listening to more Classical Indian styles, my ear became accustomed - first favoring the rhythms of the tabla (reflecting the heart chakra), then the flute (the Vishuddhi in the throat), finally allowing the range of instruments to educate me in its complexities. At the end of '94, I went on my 1st trip to India and met briefly one of the most important musical influences in my life, H P Salve - affectionately known as Babamama - Shri Mataji's younger brother. He had started a Music and Fine Arts Academy in Nagpur, India in memory of his father P K Salve, in order to enrich and enlighten Westerners' awareness of Indian culture. At that stage, it was just a few pupils housed in various apartments around town, attending classes with teachers at their houses, or with the teacher coming to them. The seed of desire was planted then in me, but it wasn't until later that I knew I had to attend the school. Ironically, it was through seeing a rock concert at Wembley Arena in London (where I was working at the time) that the desire became truly manifest. Robert Plant and Jimmy Page were combining their talents with Egyptian and other Arab musicians in a tapestry of fused styles. I knew that it was something that I wanted to try - mixing my own style (jazz/pop) with Indian Classical. I went to Nagpur for 3 months at the beginning of '96 but it was only a glimpse of what was involved. I had the basics but not the confidence to use what I had learnt in a practical way. 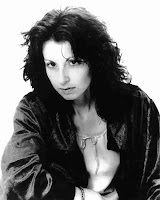 I continued to write my own songs but they were not fusing the styles as much as I wanted, so the seed of desire grew again - I knew I had to return to the Academy! At the end of '98, Babamama invited me back. By now, the Academy had its own land amidst peaceful orange groves. I spent 5 and a half months learning about the link between the notes and the chakras, as well as forming a more thorough knowledge of different Ragas and how to adapt the voice to suit them. Sadly, Babamama died in February 2000, and the Academy in Nagpur had to close down. But it did recently re-open on a new site near Thana and Babamama's legacy lives on through all the people he touched with his unique talent as a musician and poet, as well as his humour and constant encouragement to keep trying. He would always invite his pupils on stage at public performances, even when we protested that we didn't even know the songs! It was his way of showing us that we belonged there - that the music was inside us anyway. Since then, I practice most days and my voice has much greater flexibility and resonance. More importantly, inside, through using these techniques, I feel more in tune with myself. My music too has changed and reflects more accurately all the different influences in my background. VH: You have recorded and produced the album by yourself. Why the title The Goddess Within and why without any co-players? Yes I finally have my own album out in the world! It's now available on iTunes and Amazon.com - which just shows that this new day and age of the music industry is really shaping up to be made for the independent musician. Music is finally taking it's place above business. I always thought that the major record labels were due for some "karma" since they were founded on greed and money. How can a price be put on music? Counting Crows signed our record deal in the early '90's at 18 percent which meant that when a record sold, we got 18 percent of the profits while the record label made 82 percent. And that was considered a "historic" and "generous" deal for the time! We were told that we need the label so bad that without them, the world wouldn't even know we exist so as a result the labels decided on the cut. It's payback time!! With the internet, distribution has become easy and free. Artists on youtube are making millions of fans totally on their own! It's called "The Goddess Within" because it is comprised mostly of songs I wrote for Shri Mataji. In 1995, Shri Mataji asked me to write songs for Her and this record is a lot of those songs. Except for 3: The first one, "Our Queen" is a variation on a 1000 year old Celtic song about a King, "Hanging on a Star" is a song I've always loved by an English folk artist named Nick Drake, and "How You Are" is a separation song which I wrote. The rest are for and about Shri Mataji. I did everything myself because I wanted to make atleast one record in my lifetime that I could call my "letter to the world". And by doing everything on my own, it felt more like my personal letter. It was very fulfilling to do one record this way. I think it also was a result of being "the bassist" in Counting Crows for 14 years - I had to let the "other cooks" have their say, that I sort of had to "get this out of my system"! VH: I would like to know something about some of the titles on your CD. Let´s begin with the beginning. Our Queen – I like solo singing without musical support. Traditional , celtic motive and Steeleye Span´s inspiration. How did that come to your mind? MM: First song, "Our Queen" - I'm a bit of a fanatic of British "folk rock". There are 3 bands who I idolize: Steeleye Span, Fairport Convention and The Pentangle. All from the late '60's an early '70's. Our Queen appears on a Steeleye Span record as "The King" and I've always loved their version but I always saw it as a "Goddess" song - so I finally recorded it the way I heard it! VH: Feel – the first and the final tones mohan veena are replaced by the strong sound of the electric quitar. How do you perceive the connection of noisy rock music and silent sahaja meditation. Is it possible to combine that? MM: Feel: Yes - I purposely did the approach of an Eastern, meditative beginning being "stomped on" by the loudest, crunchiest Western electric guitar I could think of! The contrast is what I was going for. People are always trying to blend East and West with a light, Western acoustic guitar so I thought I'd go for the "gross" approach on this one! The "bluntness" seemed to work so I kept it. VH: Let´s go astray from your CD. Your teacher is Wishva Mohan Bhatt. How did he influence your development and what did you learn under his guidance? 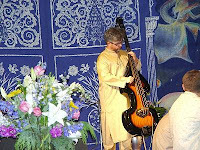 Is it difficult to play the mohan veena? What sort of instrument is that? Shri Mataji told me to learn the "Mohan Veena" or "Indian Slide Guitar" on an airplane flight from Milan to New York back in 1996. I was so happy that I had direct instructions that I immediately made plans in my mind to pursue this with all of my heart. Mother even told me the teacher at the time in Nagpur, Prashant Probakhar of the Nagpur Sahaj musicians. In December of '97, Counting Crows took 4 months off so I went straight to Nagpur to learn from Prashant. I stayed in the Academy with the great Baba Mama and all the students at the time. As Mothers' Birthday Puja was approaching in March, Baba Mama came to tell me that he managed to book Vishwa Mohan Bhatt to perform at Mothers' 75th birthday celebrations - I was amazed and so excited!! As Bhatt was tuning on the stage for his performance in Delhi, Shri Mataji and Sir CP were also seated there on the stage watching. Then, Mother called me to the stage! Baba Mama took the microphone and announced, "Can Matt Malley please come to the stage?" I went up and namaskared to Mother, who started talking to me about Bhatt's guitar! I remember She was telling me how the secret is "in the bridge". I was blinking, sleepily and stupidly, while Mother was working out something in the cosmos. She then had me sit next to Her and watch Bhatt perform. It was the most magical musical event of my life. Afterward, Mother had me hand flowers to him and his tabla player - they just looked at me thinking, "who are you and why are you giving us flowers?" while I smiled wildly. Then, one year later in '99, my wife Sesh and I were at Birthday Puja again and afterward we were in Delhi at a music store and I was buying my first professional Mohan Veena. We went right to the airport to catch our plane and who is standing right next to us checking in his luggage but V.M. Bhatt! I told him that I just bought my first Mohan Veena and he was very kind. He was on his way to perform in England at the Albert Hall, I believe. 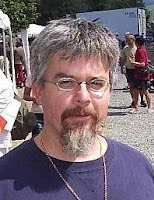 Ok...then, fast forward to last year, '07. I went to see Bhatt in concert in San Francisco and went to meet him after his show and ask if he is accepting students so he gave me his email and said to contact him for lessons when he is in the States. A few months later, in October, I saw on the internet that he was coming to LA and I wrote to him. He ended up at the Ashram here in LA for 3 nights of recording and lessons in my studio with his table player - it was magical. Then this year, in Feb/March of '08, I was at Birthday and Shivratri pujas in Pune and I ended up at Bhatt's home in Jaipur for one week taking lessons from him and his son, Sahlil. A musical mountaintop! Bhatt was once again in LA in April and he performed at the Sahaja Yoga center here in LA and also recorded an entire album in my studio - and he told me to put bass guitars on his recordings! I am the happiest bass player on earth this month as I am making a world music record with Bhatt and his table player! When we're done we're going to shop the recordings to world music labels. I can't wait!! The Mohan Veena is a difficult instrument, just because Indian Hindustani Classical music is such a deep lake. When Bhatt plays one note, you can hear all of India and it's glorious history in that note. When I try to do the same thing, it's got an American accent and is a shallow pond when compared! But it makes the ears more subtle and when I go back to playing pop or rock music, everything is like a big balloon of notes and instruments...Indian music is like jedi training for a musician! VH: Lovely Eternal – this is my favourite piece. I think that it belongs to the second half of the 90-s and to the band IPO. How do your remember the time of this recording and what did that mean for you? Did you study Vaitharna (If And When has the similar feeling – excellent arrangement and a wonderful song). MM: Thanks for liking Lovely Eternal and If and When!! Lovely Eternal was originally recorded for the IPO record - but at the time I was sick, on tour with C. Crows, and the guitar was out of tune. I was so happy to re-record it for my record in better quality and not "rushed" for time. I didn't study at Vaitharna but I was in Nagpur when it was Mothers' home at 4 Red Cross Road in Nagpur. Not Her birth home, but the family house at a later time. Then Baba Mama had us all move to the new Academy land in Nagpur and it was such a magical time for us all. He was like a lion - such wisdom, he commanded a fatherly respect from us all. And when he was sitting near Mother on the stage, he looked so small and humble! Magical times for all of us. VH: Into the Silence – possibly your latest piece. It was also present in the compilation of the American yogi last year at Krisna puja. Where did you find your inspiration and what is the meaning of that song? MM: Into the Silence is my most "radio friendly" song - I even licensed it to Mtv and some other television show here in America - they only used snipets of the song but it was nice to see it get played on tv! The words came because I sat down and decided that I wanted to write a song about how everything, every thought, plan, ambition, material object - everything - is just flowing in a stream to someday melt in the ocean. I just replaced the "ocean" with "silence" and it sort of came together and the song wrote itself. VH: How Are You – I am smiling when I hear the influence of the 70s. (the Beatles and Paul´s bass quitar, vocals of ELO). Magic Garden has also similar sound but it is more gentle. Is it there, this influence? MM: "How You Are" is a little "bitter" and about separation. It's not about Mother, but I realized that since it "came through me" and I liked the recording that I'll include it on my album. Also a radio-ready song. I liked it's "dryness" in the sound. Yes it's very '70's and that's a Hoffner Beatle Bass on the song!! Magic Garden - I liked the words alot and wanted to put them to music. It's more about the words than the music - and I kept it sounding "unfinished" - like it's waiting for more instruments. I liked the "unfinished" sound. VH: The Downing of Your Way – I heard this song for the first time in England at Adi Shakti puja at the CD 1-1. An excellent piece – organ, quitar and perfect ending of the CD. Are you satisfied with this CD and how do you feel about it? MM: The Dawning of Your Day - I was going for a Neil Young vibe with the guitars. The lead is played with one finger, sort of like Neil might play! I am very happy with my little home-made cd! I spent a lot of time on it and it's so fulfilling to be a musician in this day and age when we no longer need help from anyone. We can be our own record labels, since digital recording equipment has finally become affordable and recording studios are becoming extinct, along with record labels. The internet is the new store-front. Still though, musicians have to play live - tour to exist in the world. It's a 2 sided coin - the studio and the stage and all modern musicians have to become familiar with both to be fully successful!